The Summer 2009 photo came to us courtesy of Dan Chambers, whose uncle is in the photograph. 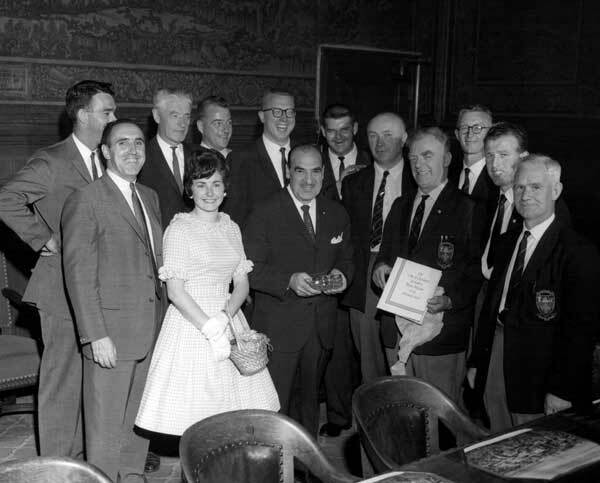 The occasion took place in 1961, when the County Down Gaelic Football team were All-Ireland Football champions and were welcomed to Cleveland in a ceremony with the mayor. Those present were (front row, left to right) Eamon D’Arcy, Pat Hollywood, Mayor Anthony Celebrese, two team officials, (back row, left to right), Council President Jim Stanton, Pat Lynch, Bill Chambers, Joe Rochford, Rip Reilly, two team officials, and team captain Paddy Doherty. Thanks to Joe Boyle and Pat Hollywood for telling us about the photo.